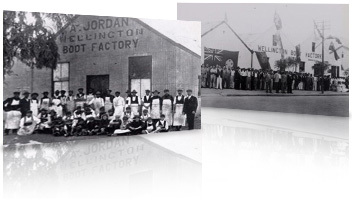 Jordan is a well-respected market leader in the footwear industry with a strong and diverse history dating back to its inception in 1899. The customer base is diverse, as Jordan supplies quality footwear to more than three hundred independent retailers, as well as most of the major chain stores in South Africa. Jordan also specialises in the supply of corporate footwear to government/parastatal departments and the security industry, both in South Africa and in BNLS countries. Slow-moving and residual footwear are sold through a small chain of factory shops in South Africa and Namibia. The footwear range Jordan offers is very diverse and well balanced as it covers men's formal and casual as well as ladies and children's footwear in both fashion and sport. Footwear sales of which the trademarks are-owned by Jordan include Jordan, Bronx, Anton Fabi, Fleetwood (fashion) and Olympic Sports. Jordan also has the exclusive distribution rights' for Asics [sports] and the following fashion footwear trademarks: Steven Madden [men's and ladies] and Onitsuka Tiger. Jordan also supplies the major chain stores with quality footwear under their own house brands. © 2012 Jordan & Co. All Rights Reserved.